For the cape in Greenland, see Cape Farewell, Greenland. Cape Farewell is a headland in New Zealand, the most northerly point on the South Island. It is located just west of Farewell Spit. First mapped by Abel Tasman, it was named by British explorer Captain James Cook in 1770 —it was the last land seen by his crew as they departed on the ship's homeward voyage. 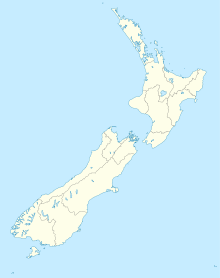 Owing to its remote location it is one of the less visited of New Zealand's major capes. The "Clifftop walk" (2–3 hours one-way along the heights of the coast East of the cape) joins the area with the beginning of Farewell Spit, and has stunning vistas of the Tasman Sea to one side, of the sand dunes in the northeast and of the towering cliffs and rocky, primal landscapes to the shoreward (east) side. Cape Farewell area satellite image. The cape is the topmost land to the west of the sandy spit. Cape Farewell Arch from viewing platform. The cape and its cliffs are composed of Paleocene quartz sandstones.. The erosion of the cliffs into fine sand carried on the sea currents creates Farewell Spit further east. ^ J.J., Kamp, Peter; A., Vincent, Kirsty; J.S., Tayler, Michael (2015). "Cenozoic sedimentary and volcanic rocks of New Zealand: A reference volume of lithology, age and paleoenvironments with maps (PMAPs) and database". This Tasman District geography article is a stub. You can help Wikipedia by expanding it. This page was last edited on 17 November 2018, at 04:31 (UTC).